Save time, stay safe…keep your blades sharp. The Model 40 makes sharpening even easier by gently holding each blade at exactly the right angle for proper sharpening. Each side of the 2-stage process works to first coarsely hone your edge and then polish to a clean finish. Compact, lightweight and easy to use. A sure investment to make more of your kitchen time, better field cleaning, success in any cutting task. Larger interface handles your larger hunting knives, too! 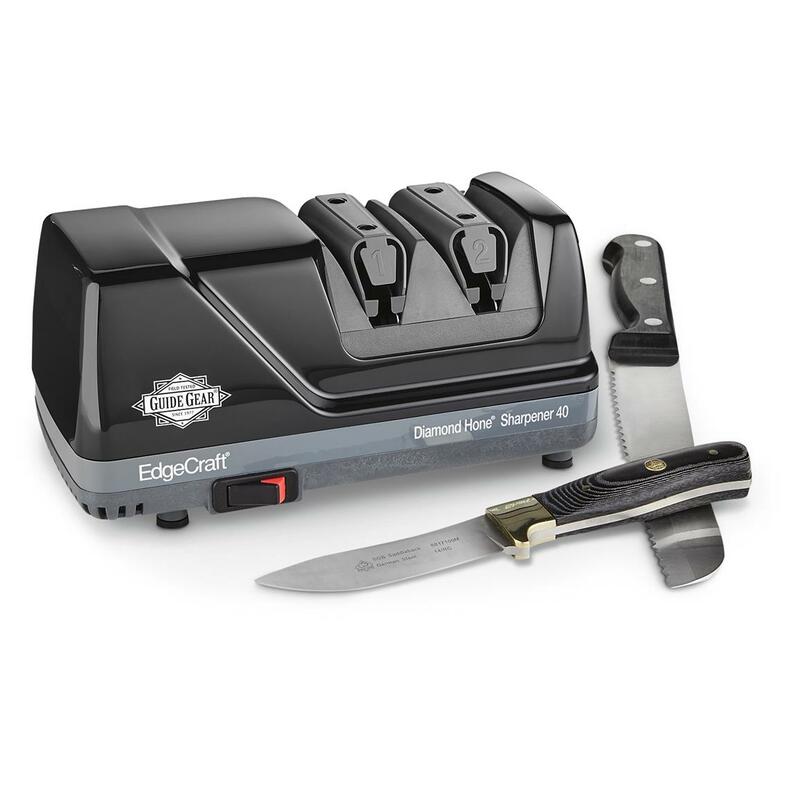 Order this EdgeCraft® Diamond Hone® Knife Sharpener today! Dimensions: 3 lbs., 2 oz. Guide Gear by EdgeCraft Electric Diamond Hone Knife Sharpener, Model 40 is rated 4.5 out of 5 by 25. Rated 4 out of 5 by Jim V from Nice Little Sharpener Puts a nice edge in place in minimal time. Rated 5 out of 5 by Kitt from Best sharpener!! I have pretty much sharpened all of my knives with ease. This product is easy to use and gets the job done in a short amount of time. Rated 5 out of 5 by CarlG from Great product/Great price Tired of dull knives? This is the product to use. Compact enough to sit on counter, sharpens quickly and effortlessly. It's awesome. Rated 4 out of 5 by SlyDog from Sharp knives Sharpener seems to meet all advertised abilities. Have used it only once. Rated 5 out of 5 by Ron C from Works great. Rated 5 out of 5 by E T 37 from SUPER Sharpened all my knives, easy to use & all are sharp, very sharp! Thin, lightweight, universal cutting power.